The start of a new year is a time to make resolutions. You might want to join the gym and lose an extra 20 pounds, be more organized, or finally learn to play the guitar. Of course, if you’re like most of us, by February 1 (if not sooner) you’ve gained another 5 pounds, are as disorganized as ever (evidenced by the fact that your Christmas tree is still up, and you’re seriously wondering whether it’s socially acceptable to just leave it up all year), and you are no closer to playing the guitar. In fact, because of the weight gain, even your air guitar skills are atrophied. That version of “Purple Rain” you used to do in your bedroom? If your kids saw you, they would say one word: fail. It doesn’t need to be that way. You can make a New Year’s resolution and stick to it. You need to stick to it, if you don’t want to be an out-of-shape former air guitar god with a Christmas tree in his living room in June. And your organization needs to make resolutions and stick to them, just like you do. In 2017, one of those resolutions should be succession planning. We’ve heard for years that Baby Boomers will soon depart our organizations, leaving leadership vacancies in their wake—and the pace of that generational shift will only increase in 2017, a year in which the youngest people born during the peak of the Baby Boom (1949-1957) will turn 60. Baby Boomers still comprise a significant amount of board and staff leadership in a wide variety of organizations. When the majority of boomers occupying those positions are now 60 or older, it’s time to take the call for succession planning seriously. But succession planning isn’t just about finding the right people. Succession planning is also about creating systems and using tools to make sure there is continuity within the organization. As a former nonprofit executive, I can tell you one of the hardest things to do is step into a new organization in a leadership role and try to figure out why things are the way they are. Why was a specific program created? Why was it abolished? Why was today’s bad decision yesterday’s good idea? Because boards rotate, and people move in and out of staff positions, one of the first places a new executive or board member should look for answers is in an organization’s minutes. Even if the minutes just contain motions and votes, minutes give you a sense of when decisions were made, and who was involved in making those decisions. Minutes help document an organization’s history, and give context to the present day. That information is critical to a smooth transition when new leaders join a board or become part of staff. 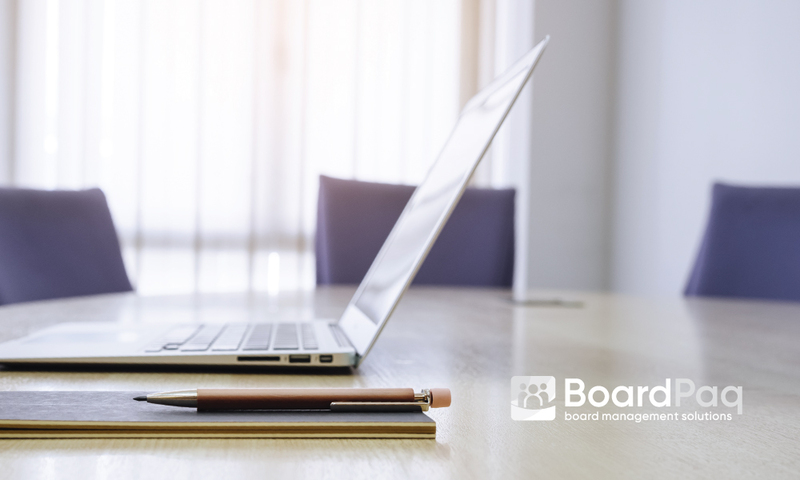 BoardPaq, the board portal of choice for many nonprofits, trade associations, school districts, community banks, and other cost-conscious organizations, is here to help make creating those minutes fast, easy—and paperless. This New Year, make a resolution to take succession planning seriously. Schedule a demo with BoardPaq today.